Did you know that an adult is suppose to get 8 hours of sleep a night and my peeps aged six to 13 need 9-11 hours of sleep. If you your not you could be experiencing some interesting things….grumpiness, sluggish, not performing well at school (or work if your an adult), not feeling well and several other things. Take care of you….your the only you this world has! I wonder what we’re gonna do next? 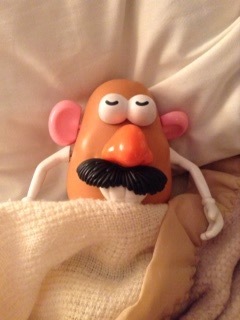 This entry was tagged blog, fun, kid friemdly, laugh, mr potaota head, photography, sleep, toy photography. Bookmark the permalink.